Inclusion is about the intentional building of relationships and creating conversations. This is a thought that guides and leads all our narratives and efforts at Snehadhara. Inclusion is recognizing our universal “oneness” and interdependence. Inclusion is recognizing that we are “one” even though we are not the “same”. Inclusionary spaces welcome, acknowledge, affirm, and celebrate the value of all learners. Our children have demonstrated with enough evidence over the past few years that they thrive in learning spaces that are receptive, empathetic and learner-led. 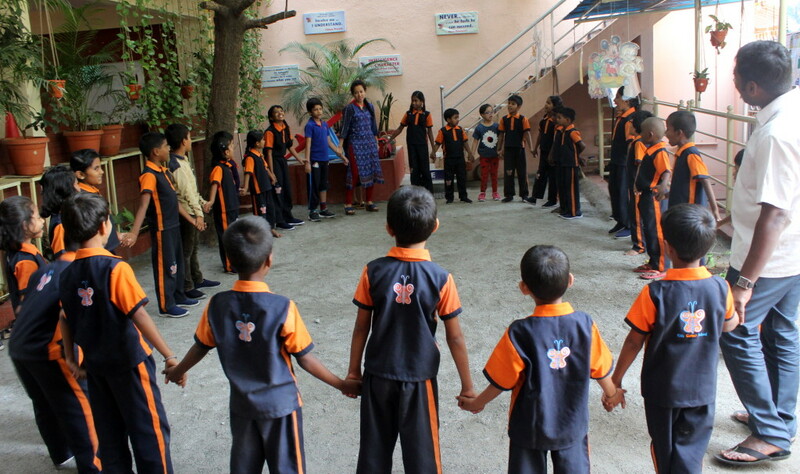 Snehasangti is our outreach programme, a collaborative Gurukul that looks at co-locating with a mainstream school in the neighborhood to see how children can engage with each other and build an organic platform of learning and social interaction. The intent of the programme is to study what it takes for a school to get ready to practice inclusion. How buddy systems created with the children serve as the shadow support the children need. What are the sets of tools and techniques needed for both set of educators ? We are set out to achieve social cohesion that we refer to as elements that bring and hold people together in society. In a socially cohesive society all individuals and groups have a sense of belonging, participation, inclusion, recognition and legitimacy. Keeping the dialogue with this effort on, we intend to thread this journey with all children using the arts as a catalyst for growth that emerges from a collective past and towards a shared future. Using the Arts as the momentum, the children will drive this endeavour towards a community, a society that celebrates diversity. 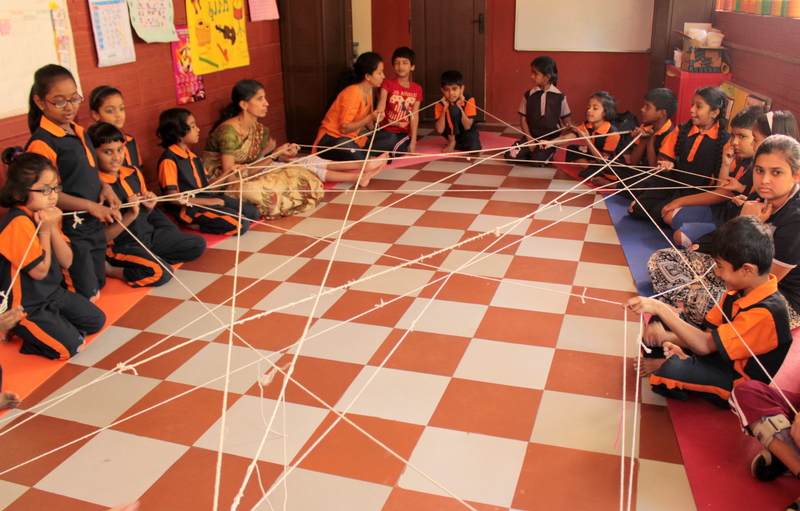 In pursuit of this, we co-located with a mainstream school Kids’ Corner School at JP Nagar to see how children can engage with each other and build an organic platform of learning and social interaction. 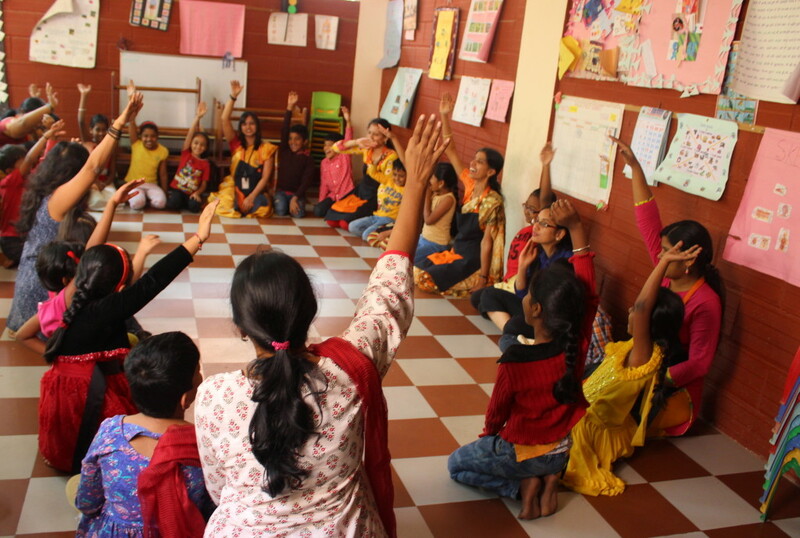 Co-locating with Kids Corner has enriched the learning for both organisations for three years. The first year of tentative steps, albeit with a strong belief in inclusion, acquainted the children with one another and opened a chapter of creative expressions leading towards allowance and acceptance. The next year saw the strengthening of the process as the connections increased and the children approached each other with more confidence. In 2018-2019, the intent was to empower the children to lead the way, to let them hold the harness and steer the program. Through dance and song, rhythm and movement, vibrant colours and playful moments, the children found their feet as they met every Tuesday. They led the warm-ups, played games and harvested opportunities to interact with each other demonstrating their ability to play and learn together in the varied field of diversity. Our engagement with Kids Corner last year was a clear demonstration of the fact that when hearts are big enough to allow, spaces open up to accommodate. 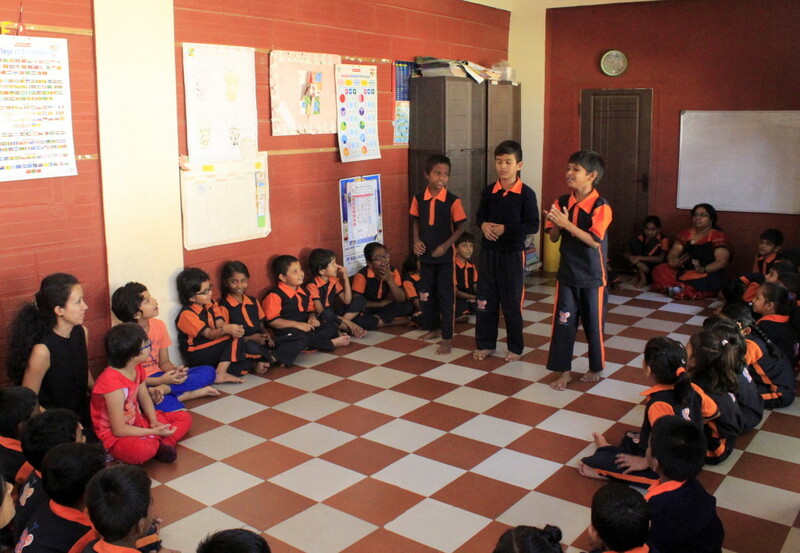 Carrying forward this conversation between the two groups of children from Snehadhara and Kids Corner, we decided to continue in 2017-18 with the same model of buddying one another, learning from each other. Every Tuesday we were learning, not just tangible forms but also communicating with, receiving from , rejoicing in, sharing with and cheering each other. This year we have seen that respect and understanding grow when children of differing abilities have the opportunity to play and learn together. We were able to put into practise our hope of creating such a community of learners. Our children once again showed us that communities grow when people honour a commitment to laugh, shout, cry, argue, sing, and scream with, and at, one another with mutual respect and understanding. We can’t ever honestly celebrate diversity if we pretend to bring in the harvest before we have tilled the ground together. So through Snehasangiti, we prepare for another year of a rich harvest of empathy, interaction, acceptance, participation and legitimacy by seeking out spaces that are ready to walk this path with us. The openness, sincerity and earnestness with which Rajeshwari Doddamani Thayyil, the Principal of Kids’ Corner School at JP Nagar, Bangalore extended support to this endeavour only goes on to further our belief that inclusion must be woven into the fabric of any effort so that it deflects the possibility of exclusion itself. Our children were hosted with grace, delight, respect and joy at the Kids Corner premises every Wednesday and amidst the artistic domain of songs and music, play and games, paints, colour and balloons a beautiful dialogue emerged. Sometimes the children of Kids Corner were invited to events which they shared with the children at Snehadhara in varied outdoor spaces. In an endeavour aimed at discovering connections in wider spaces that foster empathy, team sharing, open communication and confidence we hosted the children from the Kid’s corner school for a day long picnic along with Intel employees. The intent remained for them to partake of each other’s worlds and savour the uniqueness of the diverse spaces.